Boston Dynamics’ SpotMini is the first robo-dog small enough to be your family’s first artificial pet—but it’s still about the size of a German Shepherd. What if you want a robo-dog that’s small enough to carry in a shoulder bag as a yappy fashion accessory? 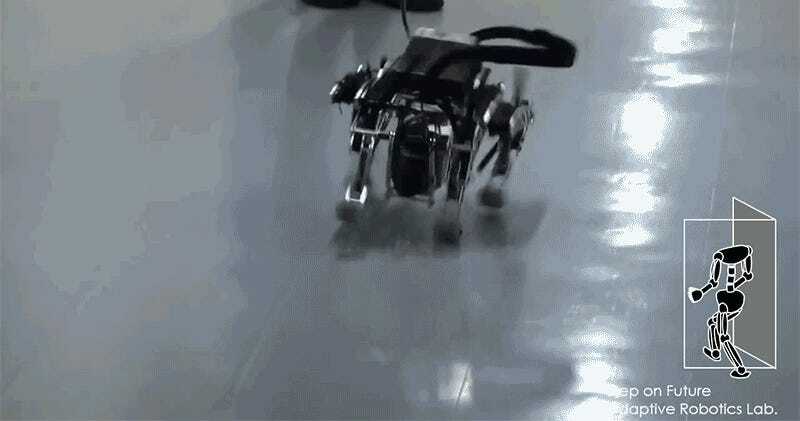 Say hello to PneuHound, which could very well be the world’s first robotic chihuahua. Instead of using electric motors and servos, PneuHound is powered by pneumatics—air-filled pistons—which is what allows the robot to frantically scamper across the ground like a hyper little dog. Developed at the Hosoda Laboratory at Osaka University, there is still some work needed to be done when it comes to steering PneuHound, at the moment it just runs into walls and people. But if you recently had to deal with the trauma of saying goodbye to your Sony Aibo robo-dog, there is at least a glimmer of hope that you’ll be able to love again soon.